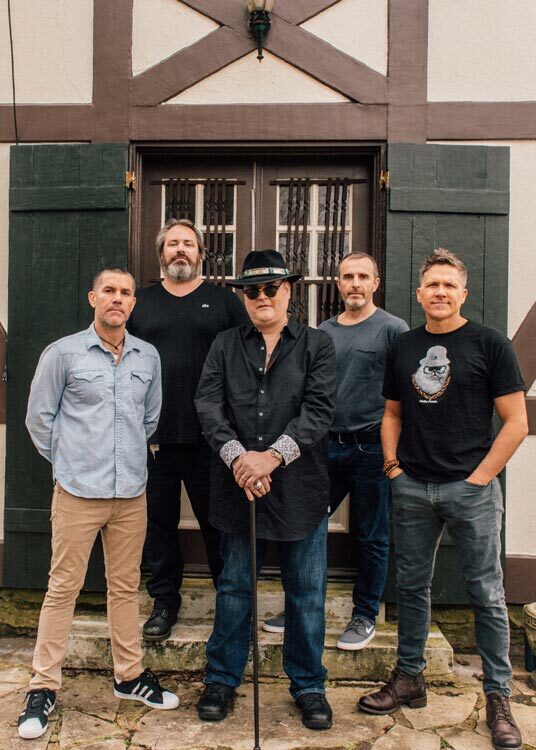 Since 1987, GRAMMY® Award-winning multiplatinum rock mavericks Blues Traveler—John Popper [vocals, harmonica], Chan Kinchla [guitar], Tad Kinchla [bass], Ben Wilson [keyboards], and Brendan Hill [drums]—have spun such tales. Moreover, they proudly continue this tradition on their 13th full-length album, Hurry Up & Hang Around. Unsurprisingly, there’s a hell of a story behind Hurry Up & Hang Around. As it goes, 2017 rolled around and marked the boys’ 30th anniversary. What better way to celebrate than to return with an all new body of work? Re-energized and focused, they hit the road for a month, joined forces with Cast Management, and returned to Nashville in order to work with GRAMMY® Award-winning producer Matt Rollings [Willie Nelson]. Rollings’ intense attention to detail unlocked a rich sonic spectrum as he challenged and pushed each member to excel without compromising or taking “no” for an answer. After five weeks, they came home with the 12 tracks comprising Hurry Up & Wait Around. Blues Traveler fittingly introduced the record to audiences with the simmering groove of the first single “When You Fall Down.” Hinging on boisterous guitars and an Animal House-worthy hook (“The party starts when you fall down”), it captures the fire at the album’s heart. “There’s a carefree innocence to ‘When You Fall Down’,” the frontman elaborates. “You’re throwing off your cares in a party scenario. Of course, it alludes to people being so wasted they fall down, but that’s always fun,” he laughs. Elsewhere, “She Becomes My Way” tempers cinematic piano chords with stirring Motown-style delivery, culminating on a hypnotic and heartfelt refrain. The guys add a twist of Blues Traveler gusto and wild harmonica to “Phone Call From Leavenworth”—originally written by an old friend, the late and great Chris Whitley. Hurry Up & Hang Around climaxes on the emotionally charged and stark piano-driven ballad “Ode From The Aspect.” Written after imbibing a “magic” plant on Jam Cruise, it pays homage to the group’s faithful fan base. That fan base has only continued to grow since Blues Traveler first congregated in a Princeton, NJ garage. Along the way, they threw out the rule book and stirred up rowdy rock, smoky psychedelica, southern folk, staggering soul, and brash blues into an intoxicating brew that only gets better with age. The quintet kicked off their career with a trifecta of gold-certified albums, including Blues Traveler , Travelers and Thieves , and Save His Soul . 1994’s Four represented a major breakthrough, earning a six-times platinum certification and yielding classics such as “Hook,” “The Mountain Wins Again,” and the ubiquitous “Run-Around”—which earned a GRAMMY ® for “Best Rock Performance By a Duo or Group.” Continuing that hot streak, 1998’s Straight On Till Morning also went platinum. Throughout the 2000’s, they prolifically unleashed albums and toured relentlessly, selling out venues worldwide and building something of a legend. However, their next chapter is shaping up to be their brightest and boldest yet. This story is really getting good now on Hurry Up & Hang Around.